Amy-Sarah Marshall and Lisa Green joined Gov. McAuliffe at a reception in June 2015. Amy-Sarah Marshall, founding president of the Charlottesville Pride Community Network, has guided the organization through six successful festivals and dozens of initiatives benefitting the LGBTQ community. In her role with Cville Pride, she’s provided safe-space trainings, presented at panels and conferences, developed a robust social media presence, and led business, fundraising, and public relations efforts. 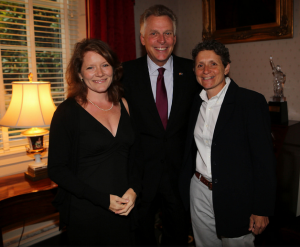 A 2016 recipient of the Q Award, given by the Business Women’s Roundtable of the local Chamber of Commerce, Marshall’s served on the UVA Health Transgender Advisory Committee, the Governor’s Task Force on LGBT Tourism, and the Charlottesville Human Rights Commission. 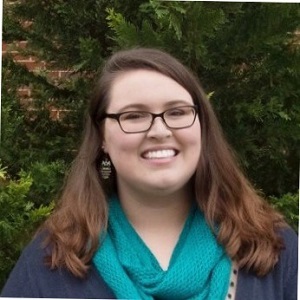 With an MFA in Creative Writing/Poetry and over 15 years’ experience writing, editing, and teaching web writing and promotion, Marshall has worked on the UVA Health web team for over seven years, performing SEO, analytics research, blog writing, and online content strategy. She lives in Charlottesville with her wife, two children, and two dogs and strives to leverage her creative and communications skills to advocate for equality, diversity, and inclusion. Jenny returned to her native Charlottesville several years ago after living on both the Right Coast (Boston) and the Left Coast (Los Angeles and San Francisco). She is a writer both in her day job at UVa and in her secret after-dark life. In addition to Cville Pride, Jenny has volunteered locally for the SPCA, Women Build of Habitat for Humanity, the Building Goodness Foundation, and Live Arts. I have been a RN for over 40 years. In my 30s I combined my love of numbers with healthcare and transitioned to management and finance. I am now retired and spend my time volunteering and traveling with an occasional short term job. I have always been politically active and believed all people deserve to be respected and treated equally. Lisa Green giving Att. 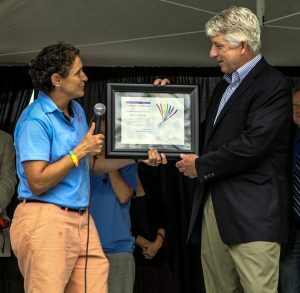 Gen. Mark Herring a Cville Pride award in 2014. Lisa has contributed to several community initiatives in the Charlottesville area over the past 11 years. 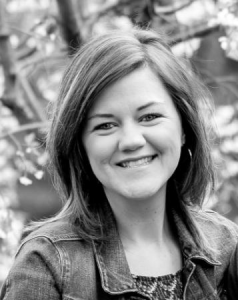 A planning commissioner for the City of Charlottesville, she serves on the Metropolitan Planning Organization Technical Committee, the Bicycle / Pedestrian Safety Committee, and the Community Development Block Grant Task Force. 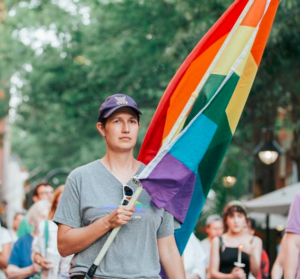 These community connections and her passionate civic engagement proved invaluable to the success of the Charlottesville’s first-ever Pride Festival, as well as the ones after, which Lisa directed in her role as Cville Pride’s vice-president. Julia Weed has a passion for helping people feel connected in their community. She led the organization of the successful Q-munity Fairs in 2006 and 2007, showcasing over 40 services and businesses that support the LGBTQ community. Julia is a middle-school teacher who provides support at school to her queer and questioning students by being open and proud, and by being involved in anti-bullying initiatives. She is a certified Olweus trainer and has been a leader in the anti-bullying education within her school for over 8 years. In 2010, Julia became a volunteer facilitator for ROSMY Blue Ridge (now Side by Side), which is a support group in Charlottesville for LGBTQ youth, and was 2011-12’s volunteer of the year. In 2012, Julia helped to organize Charlottesville’s first, and very successful, Pride Festival. Siri, is pretty unfortunate at doing bios…but she loves to volunteer. A recent addition to the Charlottesville area, she has greatly enjoyed getting know this community alongside her husband and son. Siri could fill this space with more information, but she considers herself a work in progress-stay tuned. Defines is a software architect at Silverchair Information Systems in downtown Charlottesville. After studying computer engineering at Rochester Institute of Technology in New York, he moved to Staunton in 2013 and later to Charlottesville in 2015 with his wife, Meghan. He is passionate about community outreach and education, and as a non-binary transperson, an advocate for transgender issues. Elena has lived in Charlottesville for 18 years and works for the UVA Health System. In her teen years, she was a principal member of ROSMY Blue Ride, now named Side to Side, and became a vocal advocate for LGBTQIA students in public schools. Elena served as Cville Pride’s first summer intern in 2016, helping to run social media, promote events, and keep the board members sane. After graduating from Lynchburg College, Elena returned to her hometown to share her passion, enthusiasm, and mean pasta-making with her friends, family and community. Growing Facebook fans, promoting events, setting up email templates, finding raffle donations – Elena has done it all. A force to be reckoned with and a voice for change, Elena’s initiative and input has been a welcome addition to the team. Kristen has been involved in community theatre and dance for over 20 years. In 2008, she co-produced the first-ever student run dance production at Piedmont Virginia Community College (PVCC). Her recent stage credits include playing the kind hearted Hannah in Four County Player’s Little Women (2014), and tap dancing groupie Columbia in PVCC’s The Rocky Horror Show (2015). Kristen is the Publicity and Dinner Theatre Chair for the Albemarle High School Drama Department. 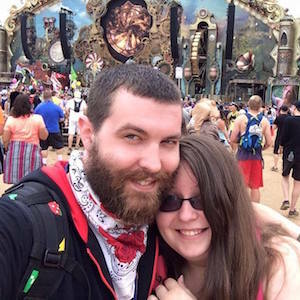 Her previous involvement with Cville Pride included stage managing and producing two festivals, as well as serving as an event coordinator for Unprom and other events. She is excited to now join the Cville Pride Board as Entertainment Director for the annual festival. Meet more Cville Pride leaders.